Fashion For Life | Hey Girlfriend! Yes, it is still time!!! 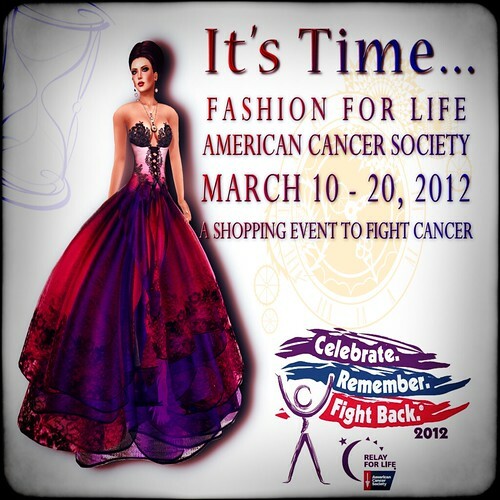 Time for shopping, time for relay, time for a cure!! One of the many brilliant things about Second Life, is how we, as residents, shoppers, designers, artists, shoppers, party-goers, creators and shoppers, can use our love of SL to benefit “real” world causes. FFL 2012 offers 10 sims filled with all of this and more, just visit and hang around awhile and you can’t help but feel the vibes penetrating the pixels everywhere. I’ve been overwhelmed with the amount of goodies to be found, not knowing where to start, so much to enjoy. For a start today, a few of the things I’ve found myself enjoying this week. I was delighted by the purple tone skin, complete with ears! !, found as a gacha prize from Heartsick. The dotty blush, with a touch of pink shadow, are an extra from Mynerva that seemed to just belong with this skin. The white dress, a donation item from Sakide, shows it off nicely I think, I love it’s flowy, lacy touches. A favorite thing about events like FFL is finding vendors and places we maybe didn’t shop at before, one for me being Lapointe & Bastchild. I so love this black S’Wear Drift Jacket they have up as a donation item so much, I”m sure it’ll be worn many times, with dresses, and jeans too. and L&B is sure to be a regular stop on my future shopping trips. I’ve also been enjoying the Amy skins from Hush, a must have for all skin lovers. Another fun skin is the Katsucide Sandra Cendre line from Acide – they come in three monochrome tones, and a variety of lip and eye make up options to suit any skin lover. I’ve enjoyed playing with them, they’ll work for so many different themes, I chose a fun flirty look with the sneaky peeky black Aphrodite dress from SYSY’s. So much shopping, so little time! There is so much more to be found, but for now, real life calls me off to my MiniMe’s first show choir state competition, but I’ll be sure to save some energy for more FFL’ing later! See you soon! FFL 2012 Map – with color legend by category, as well as vendor list by sim. FFL 2012 Blog – more info on the event, sponsors, vendors, other blogs, and much more important info. Dream Seeker Estates – who we all thank for underwriting the sims for FFL 2012. It’s time! It’s time once again, for one of SL’s best, must attend events…..it’s time for Fashion for Life!!! 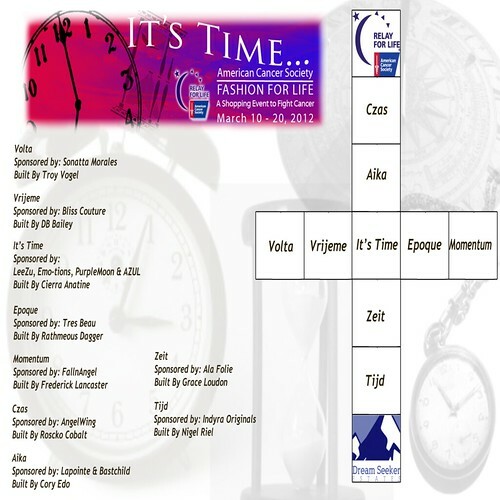 Fashion for Life is a 10 day long event to raise money for Relay for Life, a group that aids in funding the American Cancer Society, thru the sale of fashion items in Second Life that have been lovingly created by over 200 designers. 10 beautiful sims, designed just for FFL and underwritten graciously by Dream Seeker Estates, will be filled by 4 donation items, or 3 donation items and 1 gacha, per designer, as well as entertainment, gachas, a hunt, a raffle and other exciting stuff you wont want to miss. 100% of the sales of these items will go directly to Relay for Life, funding research for a cure. “It’s Time” is the theme for the 2012 Fashion for Life, and it is indeed time you’ll want to spend exploring, shopping, socializing, enjoying the builds and giving generously to this event that has become a tradition in Second Life, and kick’s off the annual Relay for Life events within SL for the year. If you love the thrill and excitement of the first hours of an event, thr rush of trying to get to all your favorite designers stores first, you’ve got a bit of time yet to get yourself ready. As with all SL events of this manner, don’t forget to prepare your AV and your ‘puter by getting everything in Power Shopping Mode in whatever way works best for your system. Syngen Sohmers and Harper Beresford did a great post in 2011 offereing tips which are good to do to prepare for events, and every day SL’ing too. A couple of the items I was privileged to preview is the beautiful “Shirley Rose” dress from Morea Style, and the graceful Hygeia (Hygeia was the Greek Goddess of Good Health – so perfect for FFL) skin from MyDear Skins. I felt both push me to the pose stand for some first pictures of goodies we’ll find at FFL 2012. I can hardly wait to get back to the pose stand and show you more, and of course, to shop and hang out at FFL 2012! I sure hope to see you there!